I know, I know – it’s torture to be locked up in an almost-empty office, slaving away and covering for your coworkers while they jet off to tropical summer destinations, while your own calendar looks relatively desolate… except for all those errands and work duties. But take it from me – it’s hard to be mad when you’ve found the perfect way to relax and vacation vicariously: with a slew of coconut-infused bath products. True, your bathroom may not be a luxury resort in Cabo (unless it is – in which case, invite me please!, and this little stay-cation of yours probably looks a little pathetic compared to all those exotic getaways you’ve been lusting after while watching The Bachelorette, but you’ll likely be pretty impressed with the amazing pampering powers of coconut. And the best part? It hardly requires any effort! 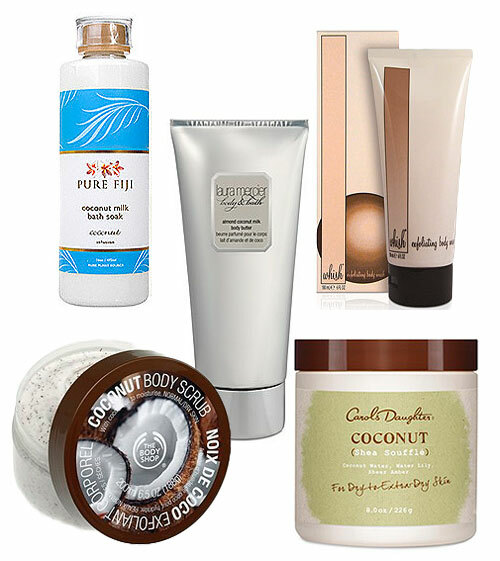 Aside from its faintly sweet, intoxicating smell that will easily transport your mind away from the stresses of your daily responsibilities, coconut is also great for your skin! Equip yourself with a coconut milk lotion, which softens and rejuvenates dry, thirsty skin, or a coconut scrub with real coconut shells and husks that help slough off the day’s sweat and grime. Check out my favorite coco-infused picks in the links below, and get to relaxing! Pictured above: Pure Fiji Coconut Milk Bath Soak, Laura Mercier Almond Coconut Body Butter, Whish Coconut Milk Exfoliating Body Wash, The Body Shop Coconut Body Scrub, and Carol’s Daughter Coconut Shea Souffle.